Social determinants of health (SDOH), as identified by the CDC, are conditions in the places where people live, learn, work, and play that affect a wide range of health risks and outcomes. Access to healthy foods, education, safe neighborhoods, and quality relationships are just a few of the identified conditions that have the power to improve individual and population health as well as advance health equity. Too often minority communities experience conditions and cultural norms that complicate health. Specifically, the Latino community often experiences gaps in access, quality, and education - and also has higher rates of individuals who are overweight, obese, and have health related issues. Studies make these health disparities clear: Adult Latinos are 15% more likely to be overweight and 65% more likely to be diabetic. Latino children are 35% more likely to be overweight than their non-Hispanic counterparts. Getting in front of health challenges facing the Latino population is crucial to achieve health equity; Miami is the perfect city and population to examine more closely and learn how to successfully bridge gaps: the 2014 US Census Report shows that the Miami-Dade County population is 66.2% Hispanic or Latino. According to a special report, Obesity Prevention in Latino Communities, "Strategies to address...disparities must include a sustained and comprehensive approach -- targeting the challenges that stem from neighborhoods, schools, workplaces and marketing environments that make it difficult to access healthy affordable foods and be physically active." Addressing the specific cultural norms and lifestyle challenges is a necessary step in making improvements and multiple sectors have a stake in bridging these gaps. Robert Wood Johnson Foundation (RWJF) has identified communities that have been successful in building the culture of health and addressing the gaps. "States and local communities have improved health by taking action and making changes. Just look at community revitalization efforts, the expansion of education programs that empower young people, and local and state economic development." RWJF recognizes the value of cross-sector collaboration and has put it into practice to improve the health and wellness of populations, specifically in Florida, through collaboration with the Health Council of South Florida. By duplicating efforts and methods that are proven successful we can close the gaps for more individuals. One effective intervention for leveling the health playing field is education. Common Threads, the national nonprofit organization that I work for, provides a preventative health care solution in urban communities through hands-on cooking and nutrition education. Common Threads recently hosted a panel discussion focused on the role of wellness education in Hispanic health within Miami-Dade, the city of Hialeah, and nearby communities. 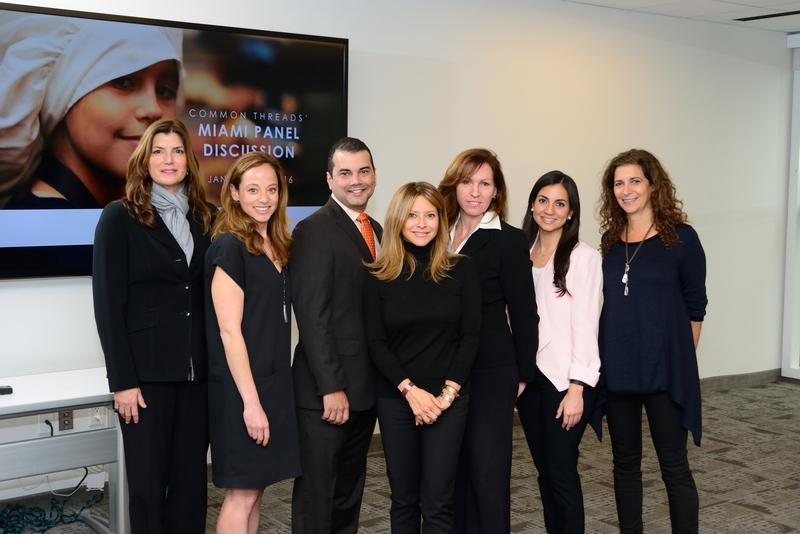 The panel brought together individuals from the community who are laser focused on building a healthier Miami. Panelists included: Sarah Messiah, Ph.D., MPH, University of Miami, Miller School of Medicine; Gwen Wurm, MD, MPH, University of Miami Miller School of Medicine; Jeffrey Lagomacini, City of Hialeah; Penny Parham, Miami-Dade County Public Schools; Lucette Talamas, RD, LDN, Baptist Health South Florida; and Ingrid Hoffmann, Celebrity Chef, Author, TV Host, and spokesperson for American Diabetes Association. The discussion drew attendees from all sectors of the community, including Common Threads' friend, Chef Richard Ingraham, and representatives from Johnson and Wales University, Peacock Foundation, Knight Foundation, Alliance for a Healthier Generation, Children's Movement of Florida, United Way, Health Foundation of South Florida, and more. Just seeing all of the players show up for the conversation in Miami was a testament to how many people and organizations are invested in getting to real change. "Change has to start with the parents. Period." "As a nation, we do not look good from a cardio metabolic perspective;" Messiah says, "and this includes both adults and children. What we are eating every day is a big part of this problem." She is right - the Scientific Report of the Dietary Guidelines Advisory Committee shows that American adults and children eat much less than recommended amounts of fruits, vegetables, whole grains, and higher amounts than recommended of saturated fat, added sugar, and sodium. This diet is taking a toll on the health of Americans. "There is a huge disconnect in the Hispanic culture when it comes to what is viewed as healthy," says Dr. Sarah Messiah, University of Miami. Messiah explains that the relationship between family functioning and health is real; weight loss is often associated with unattractiveness and illness, whereas weight is associated with being healthy. These cultural norms have consequences. Rates of obesity in Hispanic children aged 6-11 years are higher than in any other ethnic group. (NHANES 2011-12; Ogden 2014) However, perceptions can change with better understanding and more knowledge. New research supports the approach that Messiah advocates - starting with the parents - and "found that kids often take after their parents or other caregivers when it comes to unhealthy habits that then raise the odds for obesity, high blood pressure, high blood sugar, and high cholesterol." The assumption among professionals is that everyone knows what to do in order to be healthier but that is not the case; Messiah says that "many parents do not have the necessary education and knowledge needed to make changes." According to her, the medical community has a lot of work to do on nutrition education, specifically around prevention. In a study published in Academic Medicine, it was concluded that "The amount of nutrition education that medical students receive continues to be inadequate." Another survey by the University of North Carolina at Chapel Hill found that the majority of medical schools (71%) didn't meet the recommended 25 hours of nutrition education. The issue needs to be addressed at a systemic level, but in the meantime doctors can work together with nutritionists, registered dieticians, and other organizations to ensure patients receive nutrition education. True health outcomes can be affected by addressing these barriers with healthy cooking and nutrition education. "I have seen children as young as preschool-age with hypertension and other serious conditions that are caused by lifestyle issues." She has seen bariatric surgery on a thirteen-year-old child. These health issues are appearing at young ages, at a stage in a child's life when parents are still the responsible party. Every parent wants their children to be healthy but they must be equipped with the knowledge and skills to be able to foster that health. "There is no disease that is not complicated by poor nutrition." In a recent, eye-opening article in the Journal of the American Medical Association, "Lifespan Weighed Down by Diet," Dr. David Ludwig says, "Obesity and poor-quality diet predispose to all of the major chronic diseases, but these risks have been mitigated over the past few decades by an increasingly powerful and expensive array of treatments. To delay disease progression, millions of individuals in the United States depend on medications to lower levels of cholesterol, blood pressure, and blood glucose; surgical procedures to open or bypass blocked arteries; and dialysis." "We are used to a magic bullet that will fix everything, but with that we are not really healing anything. We need to look holistically at what is going on." Wurm echoes Messiah and says there needs to be a shift - the medical profession is not making people better, but is prolonging things under this model. "My advice to families is to work with your doctors. That means we need to work on education with medical professionals." If physicians aren't educated about nutrition and its role in preventing and treating chronic illnesses, patients will not be given the advice and information needed in order to make necessary changes to their diet to improve their health. According to her, it can still be approached simply. "Let's not make it too hard. Let's figure out food labels and let's eat less of the foods that are bad for us. The new dietary guidelines call for less than 10% of our calories being from added sugar. Everything that is processed has so much sugar." She has seen successful new programs like 'Fit2Play,' an after school, park program that encourages kids to appreciate health, nutrition, and fitness through fun activities. "As a doctor I can write a prescription for certain foods and for park play. We need to work with community partners and develop resources outside of physicians for referrals. This program takes the need for an after school program and incorporates nutrition and food for a holistic approach. For something to be successful it must fit into peoples' lifestyle." According to Wurm, these programs do just that - and decrease BMI and hypertension. "It is all about education." Lagomacini has successfully rallied people and organizations behind health issues in the City of Hialeah. The City received a grant from The Florida Blue Foundation for the Hialeah Healthy Families initiative to reduce childhood obesity and used a portion of that for their "Creative Learning & Play" program. The city was able to distribute portions of the money to various community organizations like Common Threads to do the "boots on the ground work." "If you build it they will come," says Lagomacini. The City of Hialeah's Education and Community Services Department reached out to experts in the form of community partners for direction and advice when creating their program. Roughly 500 kids across 11 sites participate in "Creative Learning & Play", where students come after school and have the opportunity to enjoy a healthy snack, work on homework, and get outside and play. "Participate and play with kids. Connect and engage with them," stresses Lagomacini. Children today are inundated with marketing for unhealthy food. As adults we can all play an active role in modeling what healthy looks like, whether it is during the school day, in after-school programs, or at home. 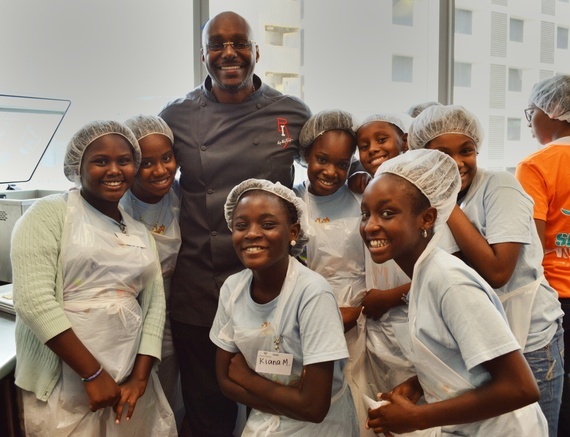 Chef Richard Ingraham, who donates his time to a number of charities, including Common Threads, is a regular volunteer with M-DCPS where he speaks to kids about his role as basketball star Dwayne Wade's chef. Ingraham communicates to all of the kids he works with that food is fuel. "It is important that these kids know that Dwayne's performance is linked to what he eats, how much he sleeps, and how that affects his ability to keep up with his exercise and training regimen." Kids who idolize these superstars are inspired to adopt healthy habits. Ingraham can also relate as a parent and shares that when he watches television with his family they connect and get moving by holding push up challenges during commercials - every little bit counts! We need more community members to advocate for our kids. "In M-DCPS we are all working together with a genuine commitment to what is best for the children." M-DCPS plays a key role in the collected efforts and is a leader - often ahead of policy in implementing health and wellness policies. Miami-Dade has been a leader in practicing sustainability by introducing compostable lunch plates, switching to fresh meal and healthy snack vending machines, and eliminating carbonated beverages and trans fats before others. "Students' school lunches do not include corn dogs, chicken nuggets, and have not had sodas for 8 years," says Parham. "Rules and guidelines are in place that regulates what can be sold in vending machines and as part of fundraisers." These changes are significant and more widespread now. A recent publication illustrated that changes to nutrition standards in school lunches mandated by the Healthy Hunger-free Kids Act were successful at improving the nutritional quality of meals consumed by students (Johnson 2016). Policy implementation increased nutritional adequacy and decreased energy density of meals consumed by students but did not affect participation in school lunch. "However, changes during the school day, regardless of how positive and powerful, won't solve the problem alone," says Penny. Partnerships with service providers and education organizations are critical for more impactful change. M-DCPS operates with an open door policy for teaming up with community partners - Common Threads, Education Fund, Let's Move, Slow Food Miami - all of these organizations are among those working with the district to reverse the troubling childhood obesity trend. "What makes Miami unique and successful is the collaboration - the way we function as one big community. Everyone needs to be on board: school board officials, administration, teachers, parents, community partners, afterschool program providers, pediatricians, and of course, the students themselves." "The new healthcare is a more preventative healthcare that focuses on wellness." The Bipartisan Policy Center, which has focused efforts and energy into the effectiveness of prevention-oriented care and explained that, "Doctors, nurses, and other health professionals are uniquely positioned to play a significant role in the prevention and management of these prevalent diseases as trusted sources of health information and guidance." The Affordable Care Act of 2010 also has an emphasis on disease prevention and the national need for this type of care. The Academy of Nutrition and Dietetics has set standards and practices for dietitians who specialize in community nutrition and public health (Bruening 2015). Baptist Health South Florida has developed numerous community outreach programs available at no cost to community members and patients. Talamas, along with other Baptist Health South Florida registered dietitians and staff, are working to reach community members through these programs in addition to their clinical and primary care efforts. Miami lifestyle, traffic, busy schedules, lack of familiarity with healthy foods, cooking methods, and basic nutrition knowledge are among the common barriers cited by families. Talamas says making the information and healthy changes accessible are important. "We use a total diet approach instead of focusing on specific nutrients in only one food. Look at the bigger picture of what you are eating for an entire day. Take small steps; start with one home cooked meal a week and gradually increase. We meet each individual patient where he or she is." "Cooking is rooted in tradition." "We need to first educate and then slowly change palates," says Hoffmann. "The Hispanic population should be healthy. We eat a lot of beans and other nutritious staples." She attributes many of the health disparities seen in the Latino population to a lack of education. She stresses that health eating is about making lifestyle changes and making better choices. Diet can be a powerful, preventative tool to maintain good health and ward off diabetes. As moms and parents there are a lot of factors working against us. Hoffmann cites food marketing, packaging, the trend towards overly processed foods, and oversized portions. She suggests engaging kids in the whole process. Have your own Top Chef challenge. Embrace world flavors and food to help kids learn about history, culture, and so much more. Make being in the kitchen and preparing healthy meals together fun. Be mindful of preparation methods - instead of frying, bake. Make healthy swaps, while still maintaining the cultural integrity of the food. One example Hoffmann cites is beans - they can still be good when made without lard. Carnitas can be made with leaner cuts of pork. Don't fry plantains, bake them. Get a pressure cooker. Hoffmann grew up cooking with her mother and this was a staple in their kitchen and still is today. Use spices - a great way to add flavor! Cook ahead - make a large portion of a dish and freeze part of it for later. Schedule time to prepare healthy meals just as you would anything else - put it in your calendar. 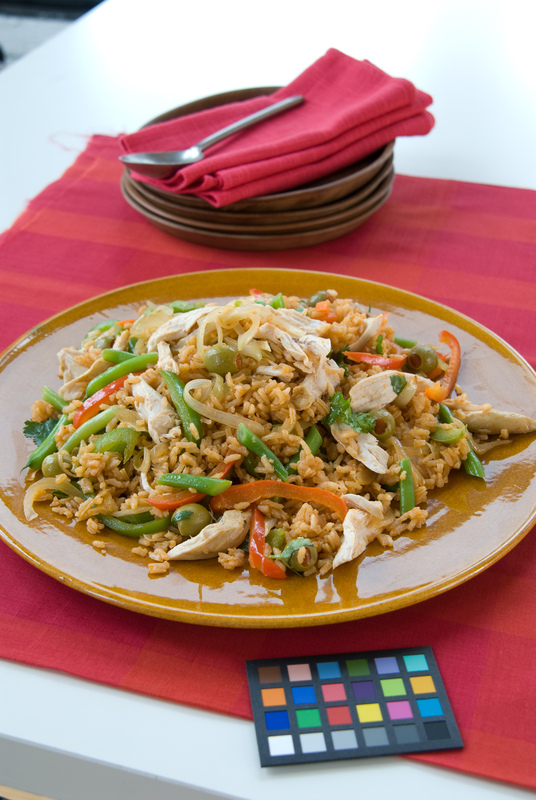 Try her recipe for a healthy take on arroz con pollo! Arroz con pollo is one of the most typical and versatile Latin American dishes. Each country in Latin America has its own version. My recipe is the offspring of the traditional Colombian version, updated for today's healthier lifestyles. Nutty brown rice replaces white rice and more veggies were added for crunch and texture. I replaced prepared ketchup for a delicious and super easy homemade version that has much less sugar and no additives. Combine the chicken, broth, beer, onion, ½ cup cilantro, garlic, Worcestershire, and seasoning blend in a Dutch oven; bring to a boil. Reduce the heat and simmer, covered, until the chicken is tender and cooked through, about 35 minutes. With a slotted spoon, transfer the chicken to a plate to cool. When cool enough to handle, shred the chicken discarding the bones; set aside. Strain the cooking liquid discarding the onions and cilantro. Return the cooking liquid to the Dutch oven and set over medium-high heat. Add the rice, green beans, carrot and 3/4 teaspoon salt; bring to a boil. Reduce the heat and simmer, covered, until the liquid is evaporated and the rice is tender, about 40 minutes. Meanwhile, in a non-stick skillet cook the bell peppers, sliced onion, and the remaining 1/4 teaspoon salt. Cook, stirring occasionally, until the vegetables are tender, about 8 minutes. Stir in the shredded chicken. Add the chicken mixture to the rice mixture. Stir in the ketchup, peas, and olives; heat through. Remove from the heat. Stir in the remaining 1/2 cup cilantro. Heat the oil in a medium saucepan over medium-high heat. Add the onion and cook, stirring occasionally, until the onion is tender, about 8 minutes. Add the remaining ingredients; bring to a boil. Reduce the heat and simmer, uncovered, stirring often to prevent scorching, until the ketchup is thickened and the flavors are blended, about 1 hour.